St Peter at Clippesby may well be one of the less-visited churches of Norfolk, especially in comparison with many others in the Broads area, because it is not easily visible until you are actually upon it, and neither is it well-signposted. It is set down a scrubby lane off at a dangerous bend in the busy Acle to Stalham road, and the secretive and beautifully overgrown churchyard comes as a surprise. 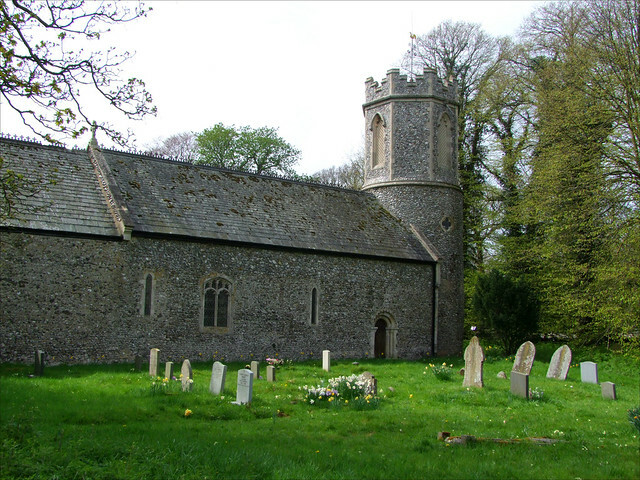 St Peter is one of Norfolk's 120-odd round-towered churches, although the tower here is a complete rebuilding of the 1870s. Despite the major restoration of this time, the church still presents a fine Norman doorway to the north. Curiously, the 19th Century south porch which is hidden from the road appears to have two Norman doorways, the outer and the inner; it is not impossible that one was brought from elsewhere, but it seems more likely that they both incorporate parts of what was once a single doorway. There is some intriguing graffiti on both doorways, the most fascinating of which is a roundel which seems to show a Norman woman praying. So the church is obviously a Norman building elaborated later then, as many are around here. But there seems to have been another considerable restoration in the early 13th Century, presumably obviating a need for anything major to happen in the late medieval period. This pretty little aisleless church must have looked very much as it does now, in its lovely churchyard, for almost a millennium. If there is one good reason for coming to Clippesby it is to see one of the major works of the early 20th Century East Anglian Arts and Crafts revival, the south nave window by Margaret Edith Rope. The Rope family produced several fine artists, but the most significant were Margaret Edith Rope and Margaret Agnes Rope, two cousins who produced some of the finest English stained glass work of the first half of the Century. The Clippesby window is important because it was, in 1919, Margaret Edith Rope's first commission. It depicts the scene of Christ allowing the children to come to him, 'for of such is the Kingdom of Heaven'. It is full of bright colours, the drawing owing something to the contemporary work of Anning Bell, but the scene full of the little details which would become the Rope Cousins' trademarks: here, the doll held by one of the little girls, the toy Noah's ark which bobs in the stream with tigers and elephants coming off of it, the frog which sits on a lilypad. An upper light depicts a priest baptising a baby, and the round window behind him becomes a cruciform nimbus, because the window remembers Alfred Rivett, Rector here 1897-1917, and his wife Anna. It is utterly enchanting. With such a dramatic highlight the rest of the interior pales somewhat, but this is a simple, well-kept church with the character of its 1870s restoration. The reredos is a fine piece, suggesting a considerable Anglo-Catholic sympathy here at that time. 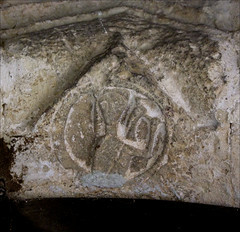 The 15th Century font is a curiosity, appearing to have had the top quarter or so sliced off the bowl, possibly to even it up after vandalism in the 16th and 17th Centuries. I couldn't help thinking that, in proportion, it is very similar to some of the Seven Sacrament series, and it would be fascinating to know what the panels depicted before they were smoothed clean. Clippesby church has two sets of pairs of brasses from each end of the 16th Century, and thus either side of the great Reformation divide. The earlier ones are to Thomas Pallyng and his wife, he in the costume of a rich merchant. The later ones depict John Clippesby and his wife. He is very much the Tudor gentleman, and with them are their three daughters, and a chrysom child, a baby who did not survive into childhood. The only jarring note in the whole building is a window depicting the Resurrection, probably of the 1870s, in garish ice cream parlour colours. As you may be able to tell, I liked Clippesby church very much indeed. I sat there, soaking it all in, feeling the warmth of the sunshine falling through Margaret Edith Rope's masterpiece behind me, when I heard - or thought I heard - a slight movement behind me. I had left both porch doors open, and as I turned I saw two young black cats, who had overcome their nervousness and were poking their heads around the doorway to see what I was up to. Well, when I turned they were gone like a flash, as you may imagine, no doubt fearful lest their inquisitiveness should prove their downfall. I went and sat outside in the churchyard, watching them explore and tumble in the long grass. Again, a noise behind me, and this time a large, adult male peacock was thrusting like a battleship through the undergrowth. What an extraordinary place. I took my leave respectfully, and headed on, pausing only to notice the new headstone on the south side of the chancel to one lovingly remembered as an inspiring Choir trainer, Artist, Poet, Thinker and a wise and caring friend.